Water colour is one of my favourite stamping techniques and I find painting ink in textured and embossed images a wonderful way to go. 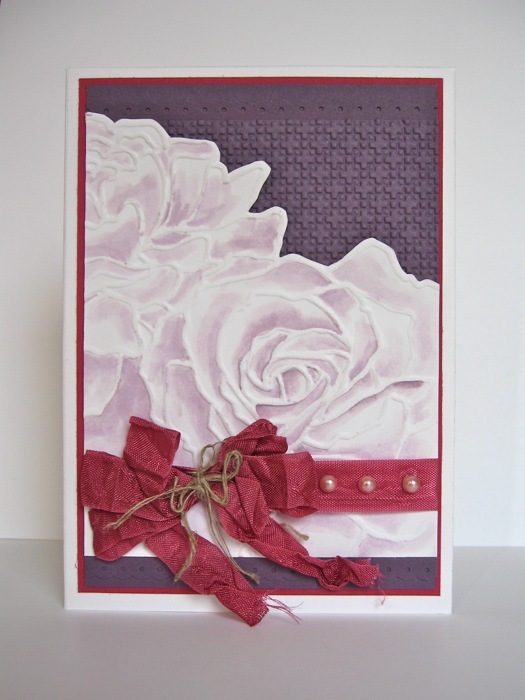 I love this Manhattan Flower Embossing folder from Stampin' Up! It works really well just by eitself or by cutting around the edge of the design as I have done here. Adding a bit of colour is as easy as getting out your Aqua Painter, opening the lid of your colour choice of ink pad, and painting happily away. Don't forget to have plenty of water and a piece of paper towel on hand. Build up from a light wash and you can get some wonderful realism happening. This is a quick and spontaneous technique . I've used the wonderful Square Lattice Embossing folder on some Perfect Plum card for the textured background, and punched out a couple of strips with the Dotted Scallop Ribbon Border. The ribbon is Rose Red Seam Binding tied together with a little Linen Thread. All the highlighted products are available from Stampin' Up!®. You are welcome to contact me via my DBWS to order the products or inquire about this technique. It's just a quick post this morning before I duck across to my friends house to help her join Stampin' Up!®. Super excited as we have been crafting together for a couple of years now and it will be so much fun to continue with her as a colleague.